I’ve been thinking a lot about the people that God places in our lives. Back in March 2013, I wrote about growing through godly friendships and about mentoring. I still believe what I wrote and the experiences I shared. Let’s take that further into networking. I was professionally in commercial radio and as a volunteer in community radio for a number of years. Radio is an industry where you advance through hard work, talent and networking. Although it’s known as a cut-throat industry (since its profit margin is not very big), it’s important to keep connections and to help each other out. You never know who will be your next employer, or what a connection may lead towards. This is the same in many businesses, and in a gentler way, it also is a component in the missionary world. Tony and I are now in Worcester, South Africa as Iris Ministries Canada missionaries – and among lots of ministry opportunities, one of the things we are planning for is internet radio. We will be airing some of the teachings from this site, including this one, as you can tell! God often brings people into our lives so that we sharpen each other in faith (Proverbs 27:17 – As iron sharpens iron, so one person sharpens another). We grow through relationship if we allow others to love, encourage, and at times correct us. Yet in order for that to happen, you have to be connected with them and not alone. We are part of nets (networking) and also man the nets (networking of a different sort). Let’s walk along further with this analogy. In July 2016, I heard Heidi Baker share many stories in the Iris Global Harvest School (in Pemba, Mozambique). One of them was a dream or an impression that she was given. As a missionary, she often sees the hidden people that ordinary people may overlook. She’s been given the eyes and heart to see them. 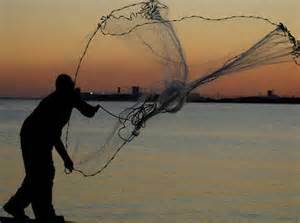 And nets are a symbol of catching these people’s hearts, like fish in the seas. Too many either fall through the cracks in daily society, or are overlooked – whether they be latch-key kids (one of the demographics on our hearts), widows, orphans, street people, disabled, and so many more. We need nets to catch them and to be in relationship with them. Heidi saw a net in the coming harvest (revival) and when she shared, she got really excited, because there were many, many fish. She originally assumed this net was of Iris’ impact in the present and future harvest of people. Then the scene in her dream widened and showed that the Iris net wasn’t that big – it was actually small (despite all the work that Iris is doing). There were many, many nets – these were thrown out by churches, ministries and individuals and these were small nets and they needed more of them. When I was hearing this, I got an impression that there were lots of empty spaces not covered by nets (yet). I personally believe that not only do we need more nets, but those nets needed to be connected. I’ve had an intermittent pastoral care sense since the 1990s where I notice people who are about to fall through the cracks. I’ve seen this in nearly every place I’ve been. It’s like people have to be intentional that they don’t fall through the nets – which happens when they get isolated from others. I’ve seen this phenomenon in many places in the world. I’ve even fallen through the safety nets myself – not in terms of my personal faith, but in terms of pastoral care and support. But that’s where Jesus comes in to catch US when we fall through the net. Jesus is the ultimate networker. We too are called to connect nets and work together in unity. We may have different emphases in our faith, but that doesn’t matter! What matters is our love for Jesus, and his love extended through us to love on the people. The fields are ready and waiting for us. But we must mobilize together. John 4: 35-36 (NLT) You know the saying, ‘Four months between planting and harvest.’ But I say, wake up and look around. The fields are already ripe[a] for harvest. 36 The harvesters are paid good wages, and the fruit they harvest is people brought to eternal life. What joy awaits both the planter and the harvester alike! But we need more sowers and harvesters! We need more people working the nets! So yes, this teaching is about missions, but it’s so much more. The networking principle works in every aspect of life: work (especially in radio broadcasting), missions, ministry, sales and basically everything that involves people. Networking involves connections and relationships that have existed in the past, as well as new ones. These people may not initially know each other, but when a networker person comes along to connect these two people, good things can happen! My husband Tony recently shared with a ministry friend about a similar organization in the same Worcester township. While these groups were aware of each other, what was new was the timing that the second organization was open to just the right kind of help. Tony’s natural sharing helped to bring about a connection that our friend had been praying about for years! This was natural networking, but with a supernatural connection. Tony has also helped connect others to get jobs at just the right time. Just think, how many of you dear people been directed to get a job through a friend of a friend? My job in the financial sector (Canadian Bankers Association in their publications and magazine), came to me through friends who were looking for a good admin temp. My last paying job was as admin and social media coordinator for Darren Canning, a Canadian prophet, author and writer. This came about through connections, and Facebook. Before that job, I was could not get a paying job for three years! Don’t look down on the connections you have. People are like gold and precious jewels – no matter where they are in the world. This means both the people holding the nets and those who are in the nets for a time. These jewels are grafted in the Body of Christ and after being healed up and discipled, they can man nets as well (in some cases, even take up nets right away)! Consider the circle of influence you have. It may be at your school, work, friendships and family. It may be a book club, or those you meet in business. Ask God for ways to reach them that aren’t “religious.” Networking and love are all about relationship. Our God is a relational God and wants relationship with you, and with these people. Just think, you may be the one to connect people to each other, just like Tony does. Or you may be one that connects your friend to Jesus. Trust him, and he will show you how. But if you go out beyond your circle of friends, make sure you do not go out alone. Go with a like-minded person who also has a heart for people. Together, ask God to connect the dots, and connect the nets. This isn’t about you. It’s about working together. So we Copples feel that one of our main tasks in Worcester is to TIE THE NETS (ministries and individuals) TOGETHER. 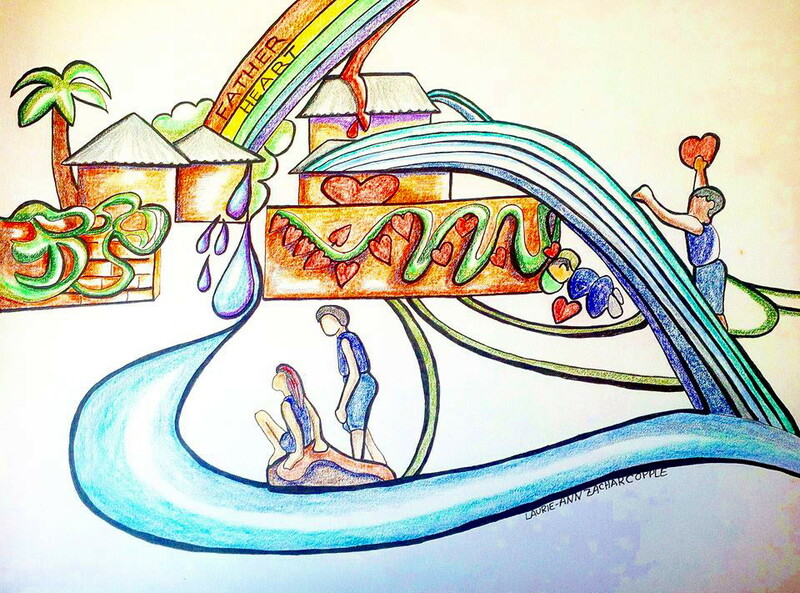 I discovered recently that a YWAM worker friend has the same heart as me – she gives her time and considerable talent to three ministries that we are also involved in, some connected with YWAM, others independent. I felt like she was a real sister, since we have the same heart that reaches out. Recently, I went to bed thinking about Heidi’s dream of the nets. I thought about John 21: 1-10, where Jesus directed the disciples to cast their nets on the other side of the boat – AFTER a fruitless overnight fishing session. It’s likely that they had an overlooked spot that was hidden in plain sight – just like many of the township or street people are. 3 Simon Peter said, “I’m going fishing.” “We’ll come, too,” they all said. So they went out in the boat, but they caught nothing all night. “No,” they replied. 6 Then he said, “Throw out your net on the right-hand side of the boat, and you’ll get some!” So they did, and they couldn’t haul in the net because there were so many fish in it. So as you think of this teaching, prayerfully consider that God may put you in just the right place and time to network. We call those divine appointments or stopping for the one. This isn’t just about evangelism, although that is a component. It’s about relationship and connecting hearts – people to people, and people to the Father. May we always remember that we don’t grow in isolation, we grow and are validated in community. We grow in interdependence, not independence. We’re bringing the heart of Ottawa to the heart of the Western Cape! Hi! Happy New Year to you, dear reader. Tony and I have now been in South Africa for two months. While it’s been very cold in Canada, it’s been hot and dry in the Western Cape – with severe water restrictions in Cape Town. Fortunately, Worcester’s water comes from a reservoir in a higher rainfall area, but the lack of rain is a huge concern to all the local farmers – our own Johan and Marie Fourie (of Iris Western Cape base) included. Please keep them in your prayers. Tony and I have been settling into our new home in Worcester, Western Cape, South Africa. Many New Year’s Days symbolize new beginnings – in our case, that was our moving day into a new neighbourhood of Hooggelegen retirement village in the Langerug neighbourhood of Worcester. It is a community on a hill – so I nickname it the “City on a Hill” – that Jesus mentions in Matthew 4:14: “You are the salt of the earth. 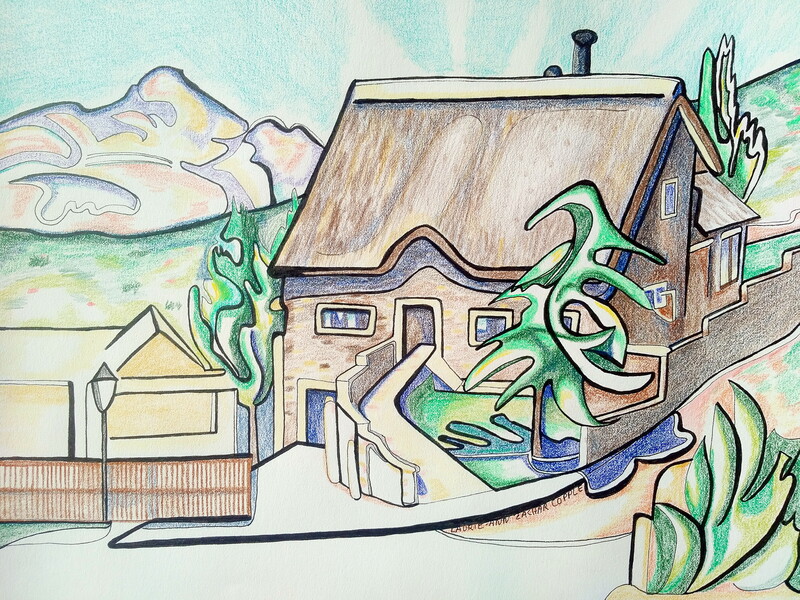 A city on a hill cannot be hidden.” I was led to book both of our guesthouses in Worcester, as well as our new 2 bedroom home, which we rent for approx. $800 Cdn a month. We can do a lot of ministry and meetings in this home (we pre-pay electricity as needed and needed to furnish the home simply, including a fridge and second-hand furniture). Our first guesthouse was up in the foothills north of the town, and we gained valuable knowledge from the hosts Ruan and Angelique, as well as buying our car (a 14 year old Mercedes) from Angelique’s aunt. Cars last a long time here in South Africa, so old cars aren’t ‘rust buckets’. All cars are very expensive here, but are also an absolute necessity. Tony is still working through the ownership details with the traffic department – kind of like the local ministry of transportation/police. We are at the roadworthy test stage – which is something the new owner does, rather than the seller, with a private purchase. Our second guesthouse (which included a kitchenette) was our base of operations over the Christmas season. We met our hosts well before we moved in. We have connected with a local church that we like (one that is missions focused, and they have simultaneous translation from Afrikaans into English). We met a lot of outreach people where we sit in “translation row,” and were invited to a home group – led by the hosts that would welcome us in central Worcester. This was one of the many confirmations about this local church. Nik and Gisela have become friends and encouragers into our lives, and both are very knowledgeable about South African living, including history and government. I found our rental home online, while we stayed at the first guesthouse. I tried in vain to find a storefront place where we could both minister and live in. One of the other Iris Western Cape couples lives and ministers in a store front with an apartment – they run a bakery and drop in centre, while they and their children live in the back – but this works for Robertson, not for larger Worcester. I was strongly led towards this little home in a gated retirement village, and thought, this is perfect for us, but how does it work with a ministry to children? We’re still working that out. Meanwhile, we have connected to quite a few ministries that work in several townships, as well as the local Boland hospice, where we go in weekly. Tony goes into Avian Park on Friday nights with a Nigerian missionary who works with the local children three nights a week – see http://bit.ly/2lZThXW. I am to join him in time. We are also involved with another Avian Park ministry called My Father’s House Worcester, which is connected with the local YWAM and headed up by our friend Jan Buchanan. I am to help them establish a web-presence as soon as we get reliable internet (we are currently using a mobile hotspot with our cellphones and mobile data). They also have an amazing couple called Marco and Rens – Marco used to be a gangster and now reaches out to the local gang JCYs, cares for teens and loves on the neighbourhood through street evangelism ‘Disciple the Streets’ and pastoral care. We are fond of this couple and intend to nurture them as leaders. We are also waiting on becoming prison volunteers in a large prison outside of town, and have been in contact with the chaplain. 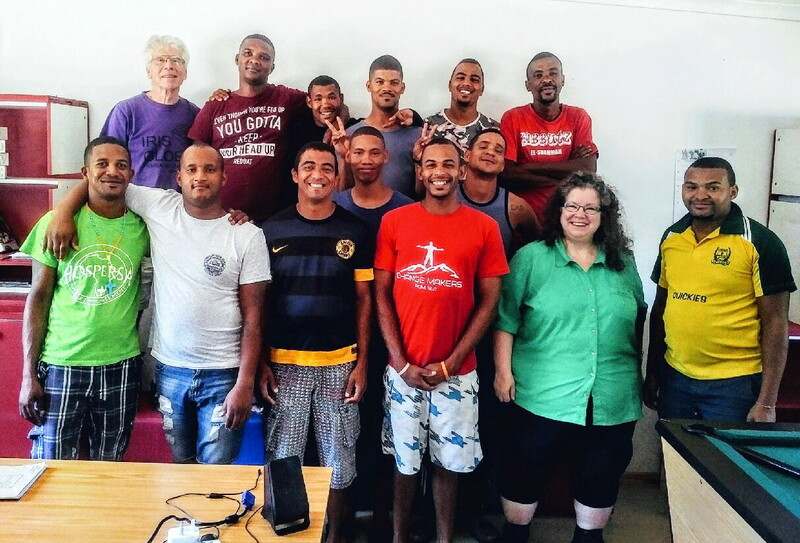 Our new church also does prison ministry there, so we may connect with what they have as well – particularly since we are learning Afrikaans and may need additional support due to language issues. Another ministry we’re connecting to is MasterPeace Academy, led by an American missionary Mella Davis. This is a private school for gifted township children (by scholarship basis). Tony will teach science daily (with a curriculum) and music once a week. 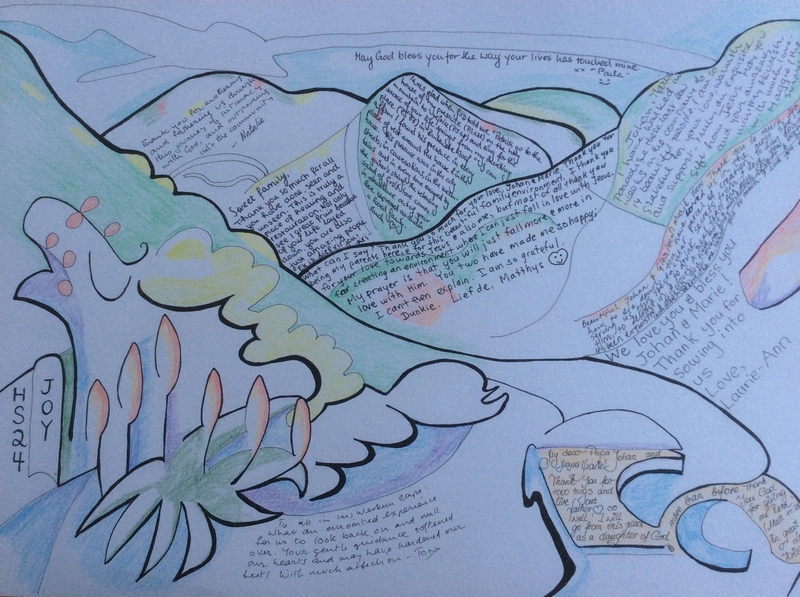 I am interested in social studies/geography, but have been advised by my Iris leaders that that’s not a good fit for me at the moment, but that I should stick with art. This school uses a curriculum called “Meet the Masters,” which is completely different from how I was taught art. Please keep us in prayer as we journey through this new venture. Mella also runs a drop-in the Chip Ross Centre for children/teens, in another neighbourhood called Riverview. This runs on Wednesdays and we may be involved. There are more ministries we are learning about – there are three others that we’re finding in our little retirement community – one couple we have met, the others we are still to meet. We feel like we are connecting all the nets of the town together to catch those who would normally fall through the nets. Tony has set up a web page which lists ministries as we encounter them – see http://bit.ly/2lf2Wug. We are finding our own expectations are different from what is unfolding – part of this is sometimes what God brings you to is different from what you imagine. The other part is that we need to be careful to be pulled this way and that by current needs only. We need to do what God has sent us to do. 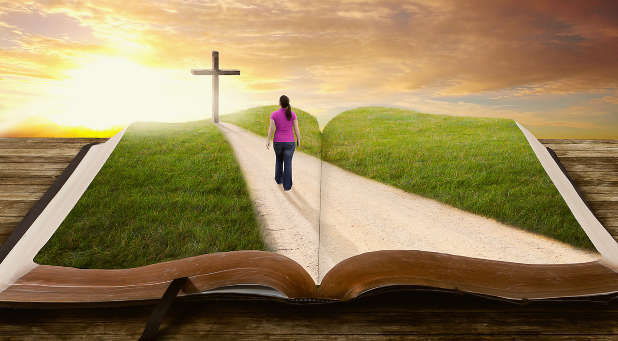 Please keep us in prayer that we will always stay on the right path. So what we’ve been learning is humility, teachability, being open to constant surprises from God, and to keep our hearts full of love. We can only do that by spending lots of time with Him – for He gives us the compassion, direction, and endless grace that we’ve been experiencing. We’ve also been learning Afrikaans from an amazing disabled couple – Andre is blind (from birth) and deaf (since age 16). He has intricate hearing equipment, so he can hear us. His wife Janey is a trained teacher, and she is deaf without her hearing aids. Together, they help us navigate Afrikaans vocabulary that we need, and we are beginning to learn sentences (prayer help, please!). Prepositions are a challenge to remember and sentence structure is definitely not like English, or even French. But we will learn. They have become very dear friends. Of note is how we spent Christmas. It was very different having Christmas in the summer, with it’s low key “festive” emphasis. Instead of turkey, mashed potatoes, and all the trimmings, we had delicious home-made cold meats of tongue, corned beef and ham, salads, and trifle. South Africans often spend Christmas season on the beach and at the braai (barbeque). We travelled to Cape Town for Hillsong South Africa’s Christmas “Spectacular” – a wonderful Christmas theatre presentation. Christmas eve brought us low-key acoustic Christmas carols and a guest preacher in our regular church. For the evening, we travelled to Robertson (not far from the Iris base) to worship in a train, called The Gospel Express. The church’s priest is Lionel, an 87-year old Anglican, who is an amazing story-teller and gives the gospel in every message. To my surprise and delight, the liturgy was so similar to our own, that sometimes I strayed from the book. When I did, I was caught by a slightly different response – but it was okay. We had missed liturgy and the eucharist, so this was a wonderful treat for us. We plan to visit again as we can. You are welcome to drop me an email at kootenaysprayer@gmail.com or our ministry email laurie-ann@coppleswesterncape.ca. 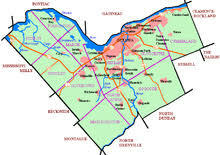 Our website is Coppleswesterncape.ca and we are on Facebook, Twitter and Instagram. If you feel called to partner with us in our work, either financially or prayer-wise, please send us an email and we’ll tell you how you can do that. You can even receive our prayer email updates. Hi! Tony and I continue to unpack from our adventures in Africa. I shared in September about our Harvest Mission school in Pemba, Mozambique, as well as about building a house for a widow and her five children in that same town. The house building is happening! Next week, the Iris Mercy department is adding a roof to her new home. The rainy season in Mozambique is from mid-late November until early March, so we are just in time to keep their heads dry. I can’t deny that Mozambique was a challenge (although Tony thrived). We looked forward to South Africa – but only partly for the amenities offered (in a country with first world amenities and third world opportunities). We found a varied nation that won our heart even deeper than Mozambique. 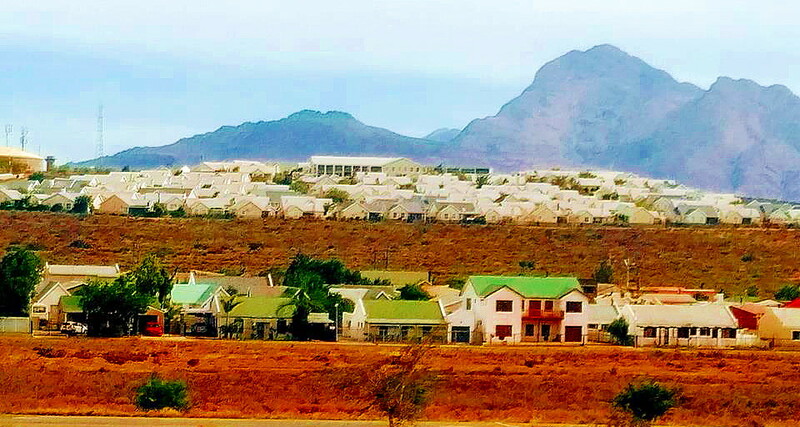 This is a divided land – which still bears the scars from the apartheid and colonial years. We were in the Johannesburg area at an Iris base for three nights, due to a change in our flight out of Mozambique. LAM (Mozambique’s airline) decided it would be more cost effective to move all Wednesday flights to Mondays, so this meant we had to end our Iris School a few days earlier. 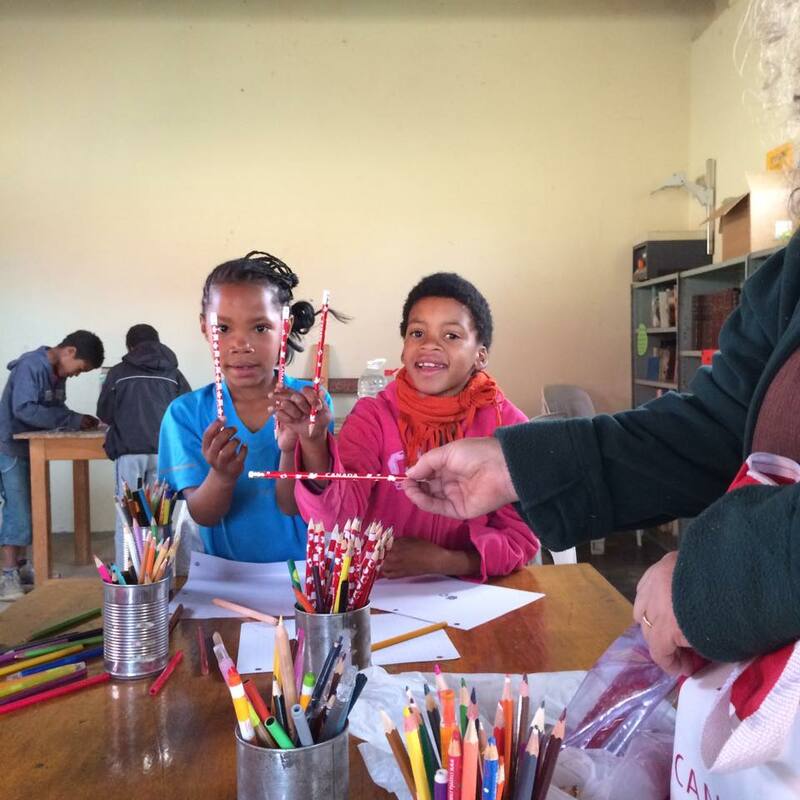 Rather than a one night stopover with our Western Cape team in a Jo’burg hotel, we now had three nights in limbo between the mission school and our outreach. So the Iris base “Footprints” took us in as well as five other outreach teams. We found Footprints was a wonderful base with a family of 32 sweet children, loving long term missionaries, and American visitors who were on their own mission trip. We are incredibly thankful for their hospitality and the sparkle brought to us by bright and fun-loving children. Fierce love showered us by “Mama” Yolanda (the base leader), Natasha, her husband Mark, and others that showed deep kindness. They took pity on my disability and that Tony had packed all our belongings together in three suitcases, rather than separately. Originally we were going to be housed with other guests in dorm according to our gender. Thankfully, a long term missionary couple loaned us their cabin, so we were able to rest and get ready for our Western Cape outreach. I brought maple syrup candies and Canadian souvenirs with me to share with the South African children in Robertson. But we didn’t have to wait to share, since we had more than enough between the two bases. So we gave away our goodies, via the leaders, so it was done in proper fashion, with each child receiving something. The base leader spontaneously gave Tony an opportunity to teach the children about Canada (since their class was learning about other countries). So as they learned about Canada’s flag and the maple leaf, while they enjoyed the taste of maple syrup candy. These kids were very receptive, and it was wonderful that they could respond in English (a luxury we didn’t always have in Pemba, Mozambique). We were really excited by the journey into Robertson, as two of the long-term missionaries, Kathryn and Barbara, drove us from the Cape Town airport. 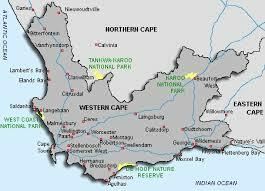 Robertson is two hours east of Cape Town through mountains, and valleys where many wineries are located. We were given plenty of opportunities to rest, relax, journal and pray. The area is farming country, and farmers are, well, quite easy-going! We were housed in a mountain homestead that had no cellphone signal, no wifi and the electrical power was generated by solar panels on the roof. 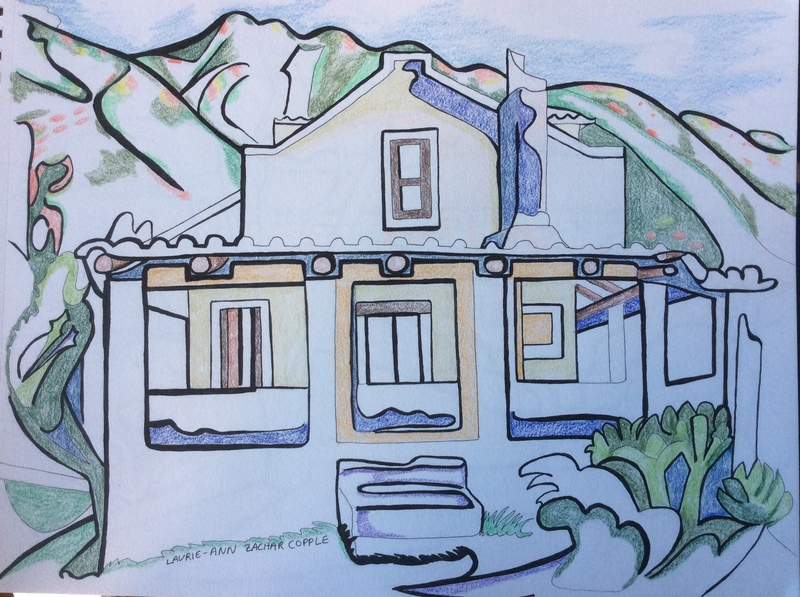 Our homestead was located in a beautiful mountain valley, where my drawing inspiration exploded. 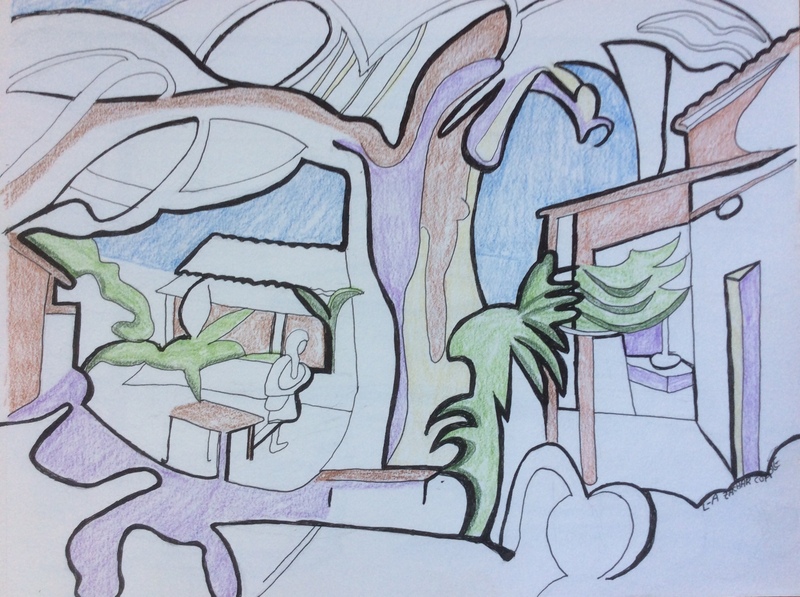 I had already drawn two drawings in Mozambique. I drew at least five more in this place! Part of my practical ministry was to draw for base leaders Johan and Marie Fourie. 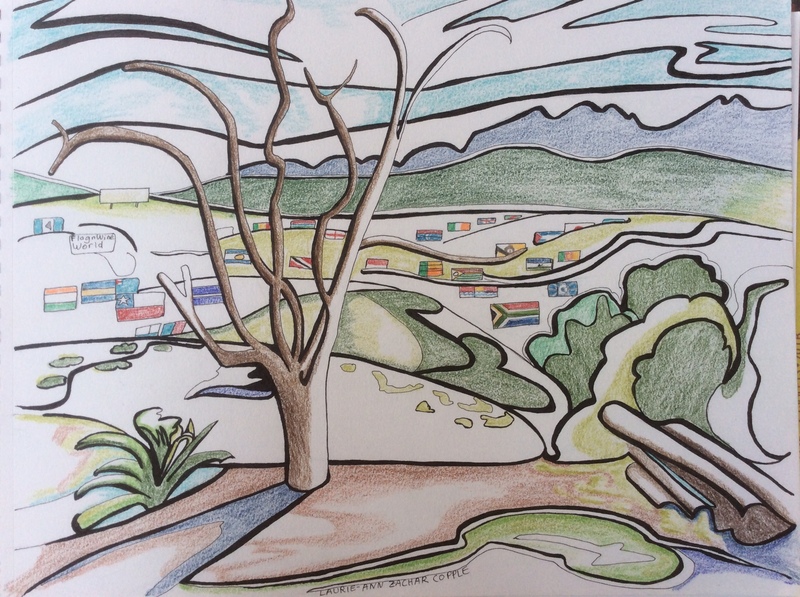 They kept a drawing that was commissioned of national flags in a field (Flag World, shown above) and another that I gifted them of the house that we stayed in (Pomegranate Homestead shown below). Because we were a couple, we are again blessed with our own room (with a toilet and shower!). Our team of ten all shared cooking duties and spent a lot of sharing and prayer together. We were from Australia, England, Germany, Ukraine, South Africa and Canada. We visited nearby “townships” – neighbourhoods of either the local Xhosa tribe, or “coloured” community. We fell in love with all of the people, but found the most receptive ones were the “coloured” people. These are a mixed-race people that seem to be forgotten in South Africa. I had not known about this demographic group, despite their presence in a documentary I watched this spring about a ministry who works in some Cape Town townships. Many of these people (but not all) are in the service industry, and they are very hard workers. Many of the farm workers in the wine growing region are from this people group. We listened to, prayed for and loved on quite a few of these people as we walked through one of their townships. We also worked with coloured children in an orphanage and others in the local hospital. I found in particular a tender compassion as I was with them, and a sense that I was “at home.” The local Xhosa (black African tribe) were also quite welcoming, although their township, Nkqubela, had an entirely different feel to it. They felt more ‘typically African’ and we connected with them as well. (We also were in community with some local Afrikaans people). We also worked with the local farm worker’s children through a nursery “crèche” and a weekly kids’ club. We found these youth quite rambunctious. I think they wore Tony out through their games of soccer, baseball and catch. I helped in the art room, by helping children draw, as well as praying for them, loving them and speaking into their lives. During the second week, we staged a play based on the Good Samaritan parable. Our South African team member played Jesus, and read scripture in Afrikaans. It was well received, as were our Canada flags, pencils, stickers and maple candy. One of my most treasured moments was of one of the girls asking me about Canada. When I showed her a picture of northern lights I had on my phone, she wanted to see more. She’s now a fan of Canada and would love to visit us here in Canada. Also from this girl, I learned proper pronunciation of the Western Cape place names around us. Our hope is to be a spiritual mom and dad to a township in the Western Cape, while we also help with various ministries at the base. I will definitely be drawing, and there is even a community radio station we could join, unless we are called to start another one. There is so much room for different ministries at this base – with different couples and families ministering in the area, as well as the long-termers right on the base/farm with the Fouries. Meanwhile we have a lot of preparation work to do here in Canada, including a lot of downsizing, and finding people to take our place in ministries we do in Ottawa. Please keep us in prayer for the process, since this isn’t official yet. When it is, you can celebrate with us! We’re back from Mozambique (and South Africa)! Posted on September 27, 2016 | Comments Off on We’re back from Mozambique (and South Africa)! Tony and I are back from Africa as changed people. We’ve been in Africa many times before, but this time was even more life-impacting – on us, and those around us. Thank you so much for your prayers and support. We couldn’t have done it without all of you coming alongside us. Some of you were on our Facebook prayer team for the journey, so you would know some of our encounters. Many of you read this blog live in the Northern Hemisphere. While most of you had a summer heat-wave from May to September, we had varied weather in the South African and Mozambican winter (located in the southern hemisphere). South Africa was cold (they do not heat their houses like we do), but Mozambique was still still quite warm and often quite hot! We found the Iris Global Harvest School in Pemba, Mozambique was an incredibly intense ten weeks. We learned alongside 248 internationals, plus 300 Mozambican pastors who were paired with us in groups that were named after colours. Our colour group was light brown, and we went on a trip together to a nearly unreached village called Linde. It is not far from the mining city of Montepuez, where they mine rubies. The people in Linde were very welcoming and open to our message and love. We made some friends, even though our knowledge of Makua was limited. There were a number of dramatic healings while we were there, including the curing of blindness and deafness in some locals. Another team that included friends went to another village, and they prayed for a four-year-old boy who had died of malaria earlier that day. He was certified dead by the village chief. After they prayed for some time, the boy began to return to life! Yes, raisings from the dead still happen! The boy’s father came to faith in the process and joined in with the prayers for his son. They took the boy to the hospital for follow up and he was confirmed as recovered from malaria. He is going to be fine! I also was able to share my coming to faith story in Linde before the assembled crowd, and many people in the village came to faith in Jesus Christ. 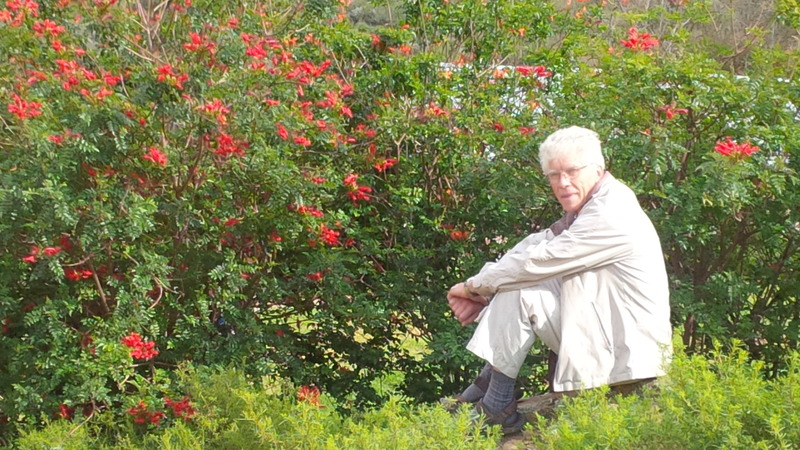 Tony and I were also encouraged by an Ottawa friend that we were to leave a legacy in Mozambique. I had assumed that meant we would sponsor or bless a former orphan, but it seemed that God had something else in mind. Tony and I were paired with a Mozambican mama named Maria. Maria is a widow with five children and she does not have a job (we did try to get her one, but she was not hired). She and her children live in a two room bamboo and stone house with a broken tin roof. There are many holes in the walls as well as the roof. Her house is located at the bottom of a hill, beside the village latrine. During the rainy season, her family cannot sleep laying down, because the house seriously floods. It is also not secure from thieves or wind. We were asked to help with house repairs. So we asked the Iris mercy ministry to help us estimate what was needed. They told us that the house was not worth fixing, but that she instead needs a completely new house constructed for her. House building is one of the ministries that the Iris mercy department does for poor widows and families. Maria is not the only one that needs help! It costs $3,200 USD to build a new concrete block house. We prayed and were led to begin a fund with Iris Pemba and Iris Ministries Canada so that Maria could have a new house. We didn’t think we could raise enough on our own to build her a house this year, but thought perhaps next year might be do-able. Maria was worried for this year, but it turns out that God has other plans. Tony wanted to set up a new campaign on Go Fund Me (a crowd funding website), but I strongly felt led to tell Tony that we needed to just trust God for the funds. He met with two friends on our return to Ottawa, to share and to pray with them about their own needs. Both of them took out their chequebooks and wrote large cheques to Iris Ministries Canada. We also received some unexpected funds, and then were were only $400 Canadian short of the goal! Tony decided to not wait for the rest and sent the remainder to Iris Canada (although another friend gave on our GoFundMe page towards the house). This means that Iris can build Maria’s house in early October! God is so good! His plans are so much better than you can ever expect. We are so pleased about this quick answer to prayer. We found many more answers to prayer when we were in Mozambique. We were continually reminded of God’s faithfulness and we often felt his love, mercy and compassion. We even had mercy extended to US during our time in Pemba. We went to lunch with our colour group in a beautiful beach restaurant and one of our group wanted to be baptized. After she was baptized in the Indian Ocean, we spent some time together and headed back to base in a truck. I had help to get into the truck by standing on concrete blocks because it was so high. After Tony and our group leader helped me in the truck, Tony left behind our shared bag of valuables. (!) Both of us thought that the other one had the bag. As soon as we were back on base, I asked Tony for the bag. He and Kenny, one of the leaders, immediately drove back to the restaurant, and our other leader phoned them right away, so they could look for it. Tony and Kenny inquired about the bag, and were asked many questions about the contents. After satisfying the owner of the adjacent hotel, our bag was returned with not one single thing missing! We were so thankful that an honest guard handed in the bag to the management. This action was highly unusual since poverty is so severe in this area. After we thanked God for his mercy, I was reminded of Matthew 5:7, “Blessed are the merciful, for they will receive mercy.” This was a promise to us, since we had continually showed mercy and help to Mozambicans in (what seemed to us) small ways. We weren’t counting the acts of mercy, especially since the needs could be overwhelming. There is a good reason why Iris Global do-founder Heidi Baker says to “stop for the one.” If you stop for the person that God brings to you (like a divine appointment), loving your neighbour one on one becomes do-able. You can ask the Holy Spirit to fill you with compassion and guidance each time. We did this many times and it works, although it is always best to pray and worship beforehand, so this comes as an extension of your devotional time with God. We found there were many needs on the Pemba base, including: working with former orphans, widows, primary, elementary and high schools, library classification, media team, the visitor centre, feeding programme, farm, clinic/birthing centre, Bible school, Pemba University, Harvest School, Iris Arts, and weekly bush outreach. That is only part of what they do in northern Mozambique, and they may do radio as well. Although I saw the radio as an opportunity, my heart was and is pulled to South Africa. We’ll see how that works. I’ll share about our time in South Africa soon. If you are local to Ottawa, we have an in-person report back at St Paul’s Anglican Church in Kanata, Ontario. It is on October 1st at 9 am for coffee/tea, muffins and 10 am for presentation. If you’d like to learn more, please let me know (click on contact). The QR code is at the bottom of this post. 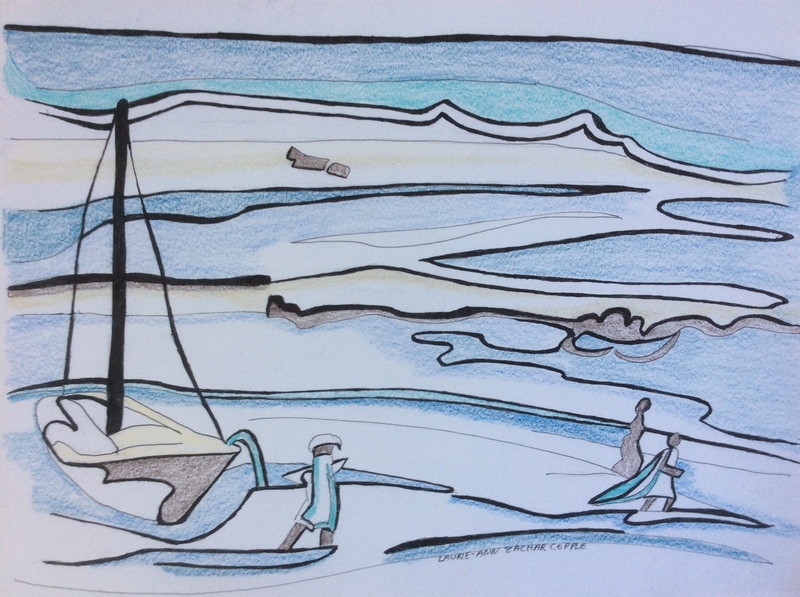 I did this drawing from an iPad photo of fishermen working during low tide by Wimbe Beach, near Pemba, Mozambique. The view was near Kauri restaurant. 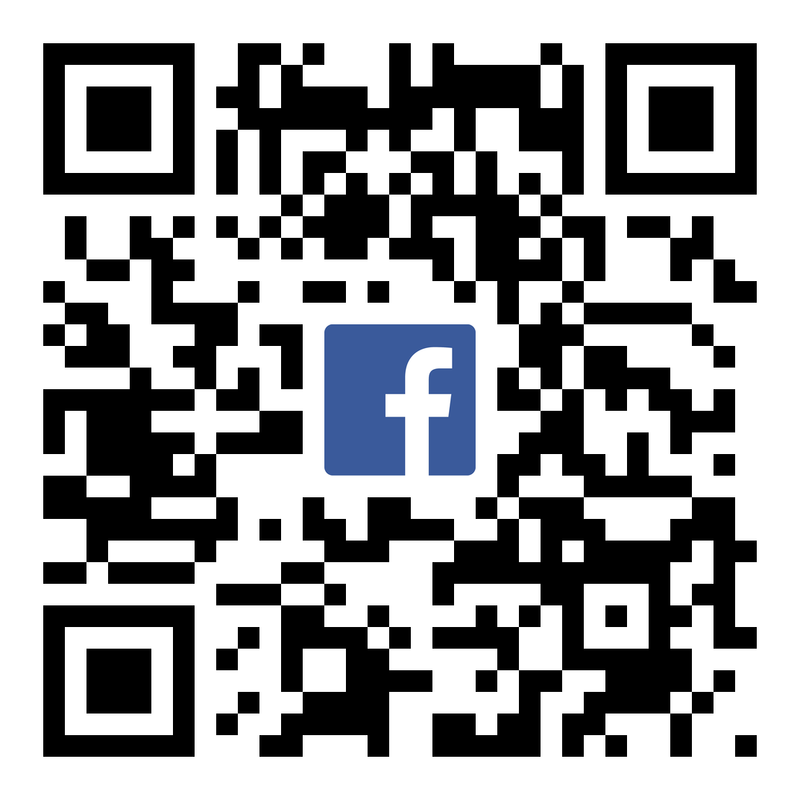 This is the QR code for our report back on October 1st. If you have Facebook, it will give you the info and address you’ll need. Join us! Comments Off on We’re back from Mozambique (and South Africa)!